Blood has special protein hemoglobin that carries oxygen to all parts of your body. Pregnancy anemia due to iron deficiency is a low hemoglobin disorder. 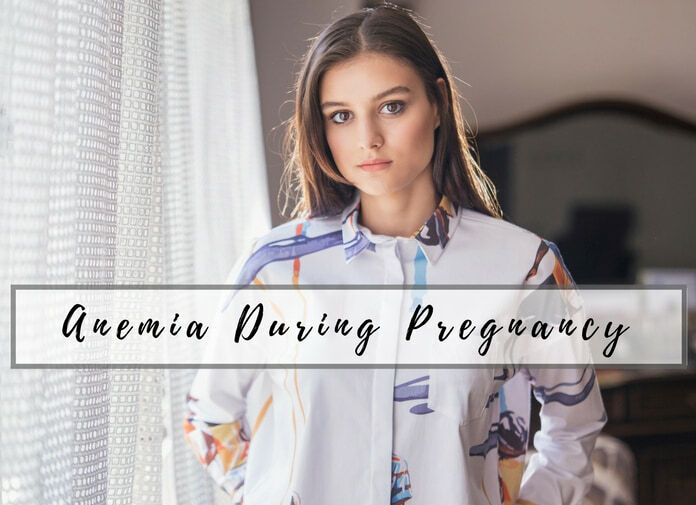 Ironically anemia occurs during pregnancy when blood loss through period stops. Your baby developing inside your body uses up a lot of the nutrients that you take. Now that your body has to produce more blood it needs more iron. Lack of proper nutrition makes it difficult for the body to cope up with the iron demand. It is very common for a woman to have anemia due to iron deficiency or blood loss. Temporary anemia during pregnancy is just like gestational diabetes that goes away soon or after delivery. Slightly anemic is not a problematic issue. Once the normal hemoglobin levels during pregnancy drop below the lower limit, there is a risk of pregnancy complications. Your tissues do not receive enough oxygen because of which you feel fatigue earlier than usual. The reason for feeling tired without actually doing any work is because of lack of oxygen reaching cells. Women with low iron during pregnancy need to take more of it through diet or supplements to reverse pregnancy anemia. Low hemoglobin in pregnancy is because of iron deficiency mainly, and intake of iron restores it. What causes low iron levels in pregnancy? How is pregnancy anemia diagnosed? An anemic woman doesn’t have enough red blood cells. Symptoms of anemia are lack of energy, low hemoglobin and feeling breathless. The anemia condition is temporary and dietary supplements can cure it. Anemia treatment depends on the cause of anemia during pregnancy. There are three types of deficiencies that can lead to pregnancy anemia. The low iron in pregnancy is the cause of pregnancy anemia. The most common type of anemia found in pregnant women is because of iron deficiency. Iron is an essential component of hemoglobin. Daily demand for iron for a pregnant woman is 27 mg. Oxygen needs iron to bind to hemoglobin. When there is iron deficiency, oxygen transport dramatically reduces. Every cell needs oxygen to be able to break down food and utilize energy for carrying out its function. Symptoms of iron deficiency anemia pregnancy are palpitations, paleness, and weakness. A woman with anemia before pregnancy is at higher risk of having it during pregnancy. When the level of hemoglobin drops below 11mg /dL, the condition is anemic. Generally, during second and third-trimester women suffer temporary pregnancy anemia. The reason is the increase in the demand for iron. When the plasma volume increases more red blood cells compensate to create a balance. During the second trimester there is a rapid development of the fetus, and so it is common for the hemoglobin levels to fall. Anemia diagnosis during the second trimester is after the hemoglobin level drops below 10.5 mg/dL. When the level of hemoglobin goes below 6 mg/dL iron shots or blood transfusion might be considered. In other cases taking iron rich food during pregnancy prevents anemia. Chronic vitamin B12 deficiency can lead to pernicious anemia. Women anemic while pregnant can be because they are not taking enough vitamin B12 in their diet. Loss of weight, numbness, and lethargy are most common symptoms of vitamin B 12 anemia while pregnant. Can Vitamin B12 anemia during pregnancy affect the baby? The form of anemia in pregnancy due to low vitamin B 12 can cause preterm labor and congenital disabilities. Vitamin B12 is essential for the neural development of the baby and deficiency can interfere with it. Poultry and red meat have a lot of vitamin B 12. You can consider taking supplements of vitamin B12 if you are not able to eat meat or eggs during pregnancy. Digestive system diseases affect the gut flora. Intestinal bacteria also produce vitamin B 12. Probiotics can help establish a healthy gut flora. Along with vitamin B12 and iron red blood cells need Folate for efficient oxygen transport. The developing fetus also needs Folate for healthy nervous system and prevention from congenital disabilities. Supplements of Folate or Folate fortified food during pregnancy helps meet the requirements of the factor. But in conditions deficiency, it can lead to anemia pregnancy. Vomiting can easily deprive you of folic acid. The baby actively uses up folate as the nervous system develop. Vitamin C rich food and green leafy vegetables have a storehouse of Folate. You can opt for fortified cereals and legumes to make up for the deficiency. Most gynecologists prescribe Folate supplements during pregnancy. During pregnancy, the blood plasma undergoes an increase in volume. Red blood cells have a lifespan of 120 days. Your baby also needs blood supply from you. With the increase in plasma, the red blood cells must match up the pace. However, morning sickness and aversions don’t allow enough dietary intake. And this leads to low RBC count per plasma volume unit. Iron levels are low because of its use in making RBC and reduced intake. Other reasons for low iron levels in the blood can be because of consumption of soya and tea. The tannins in tea counter the absorption of iron. Loss of blood during pregnancy due to spotting or any surgery increases the risk of low iron. There are many pregnancy complications because of anemia. Every type of pregnancy anemia has specific problems associated with it. When the levels of hemoglobin drop below 6mg/dL the condition is considered severe. Prolonged anemia can cause stillbirth and unconsciousness. It is easy to detect anemic during pregnancy symptoms. When you have low hemoglobin pregnancy paleness and weakness is continuously present. The signs of anemia during pregnancy are not very different for the three types of pregnancy anemia. Most common anemic symptoms are light colored blood and low energy levels. The iron deficiency symptoms do not pass on to the baby. Even when you have anemia throughout pregnancy, your baby will not have iron deficiency. Fetus absorbs enough folate and iron needed for its survival and storage. Anemia during third pregnancy trimester can lead to developmental delays or anemia in the baby. A blood transfusion is also possible if the bleeding during labor is heavy. Other risks of anemia while pregnant are postpartum depression. However, this is only when you don’t treat anemia, and the condition is severe. Normal hemoglobin levels during pregnancy must be above 11 mg/dL. A history of anemia or heavy pre-pregnancy menses are risk factors for pregnancy anemia. The low levels of iron make a complete blood count test essential. Your doctor will do a blood test for pregnancy anemia in the first trimester. Even if you don’t have symptoms of anemia another test is possible during the second trimester. When the blood test has low hemoglobin and hematocrit levels, you have anemia. The hematocrit is the measure of the percentage of RBC in blood. Hematocrit less than 33% is anemic, and hemoglobin below 6 mg/dL is severe. During the second trimester when the hematocrit levels are less than 32% and hemoglobin less than 10.5 mg/dL is anemic. For treating anemia, it is essential that you replenish the lost iron. Other than that in severe cases, blood transfusion or iron shots can treat anemia. How to treat anemia in pregnancy? Make sure you eat iron-rich food and avoid iron countering diet elements. Tea, beans and excess calcium reduces the iron absorption. Caffeine during pregnancy inhibits iron absorption. Any other gut problem such as Crohn’s Disease needs treatment for the cure of pregnancy anemia. Proper intake of iron during pregnancy reduces the chance of getting severe anemia in pregnancy. The following natural ways to prevent pregnancy anemia are effective. Iron-rich food: Iron absorption and intake both count for maintaining healthy levels. What foods are rich in iron during pregnancy? Broccoli, Bell peppers, and guavas are a rich iron source for vegan mothers. Seafood during pregnancy is a rich source of iron. Vitamin C containing fruits and vegetables: Oranges, plum, and strawberries are sources of vitamin C that even help with morning sickness. Pomegranates are also loaded with iron. Folate deficiency anemia while pregnant treatment requires a diet rich in vitamin C.
Prenatal vitamins: If you are not able to take the recommended amount of vitamins during pregnancy consider supplements. Once your doctor prescribes some prenatal vitamins you can have them. Consult your OB before taking vitamin B 12 from artificial sources. Probiotics: Naturally present gut bacteria can synthesize vitamins and cofactors. Yogurt, almond milk, sour creme, and cheese are other options to include natural bacteria in the diet. Make sure you are not lactose intolerant before you opt for any dairy products. Lean meat: Meat especially liver is one of the richest sources of iron. If you are not a vegan, then do eat meat and eggs to prevent anemia. Anemia continuing after pregnancy can lead to postpartum depression. When the blood volume and hormone levels come back to normal pregnancy anemia vanishes. Preventive measures and treatment help in quick recovery from severe anemia in pregnancy. Next articleWhat To Do After A False Negative Pregnancy Test?